I played with Mattel Hot Wheels when I was a kid. 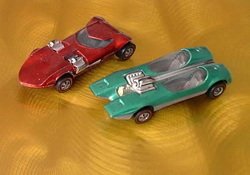 Unlike the toy cars before them, most notably Matchbox, Hot Wheels not only looked fast, they were fast. They could be raced across the floor or on their now iconic orange track with its gravity-defying loop. And they could be crashed into each other at high speeds. As the teen years approached I set most of my toys aside, only plastic modeling continued as a hobby. I kept nine of my Hot Wheels that were still in good shape and threw away the rest. Following the birth of my daughter I found myself spending a lot of time at Toys R Us buying diapers and baby toys. I would often wander over to the boys toy section. This reconnected me with Hot Wheels which I hadn't played with since I stopped buying as my teen years approached. I remember seeing adult men going through the cars on the pegs. Eventually, I asked one of them what he was looking for. He told me he looks for cars that he likes to collect and introduced me to t he world of collecting. At one point I recalled putting away some of my childhood Hot Wheels. I found them in a box at my parents' house. There were nine of them and they were all in good shape. I owned more as a child but these managed to survive. Including the green Splittin' Image with which I won a race and trophy at a local toy store, Red Balloon. I began collecting Hot Wheels in 1996 shortly after leaving a 79 cent Hot Wheels Treasure Hunt Gold Passion, a casting based on a custom '49 Mercury, on the pegs at KMart. That car is now worth $100! Several months later I found and bought three other Treasure Hunts at Target. I was hooked. At an annual giant flea market I came upon a dealer selling the origianl Hot Wheels from the late sixties. I bought a chrome Mustang called the "Boss Hoss". Thus began my journey into collecting redines. 1. BUY WHAT YOU LIKE. You will never be disappointed. 2. PERSISTENCE PAYS OFF. If you really want to find that elusive car, there is nothing like persistence. But when collecting takes too much time away from family ,work and friends, you may have gone too far. 3. VALUE. Collectibles are worth what the buyer and seller agree they're worth. 4. LIMITED EDITIONS. A Limited Edition of 5,000 is not necessarily worth more than a Limited Edition of 25,000. Desirability is the key, not production numbers. 5. DEALERS. Anyone who constantly buys stuff old or new for resale is a dealer. Then again most collectors are dealers to some extent. Hmmmmmm. 6. FUN. Fun is the most important part of collecting. If you are not having fun then you shouldn't be collecting. So have fun! Thank you for the international dispatch. Fantastic Item! Super Trustworthy! Click on icon to send email to me.